Stardock Entertainment has been around for years and they’ve had their hands in a variety of software endeavors. Originally known for making Microsoft Windows usability applications (such as WindowBlinds), they’ve sought to diversify with game development. Now they’re making a name for themselves in the game space with strategy titles like Sins of a Solar Empire and Fallen Enchantress: Legendary Heroes. 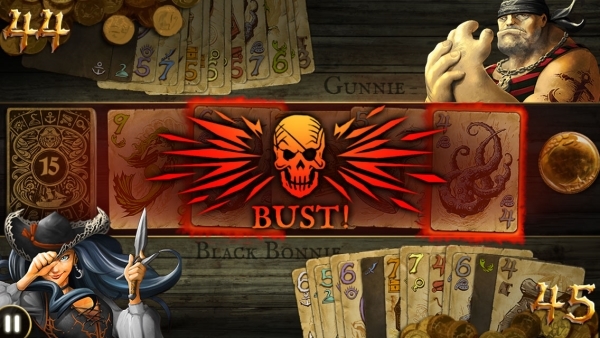 Stardock is looking to diversify once more with Dead Man’s Draw, their first entry on the iOS platform. How does it hold up? Has it earned its loot or should be drowned at the bottom of sea? Let’s find out. 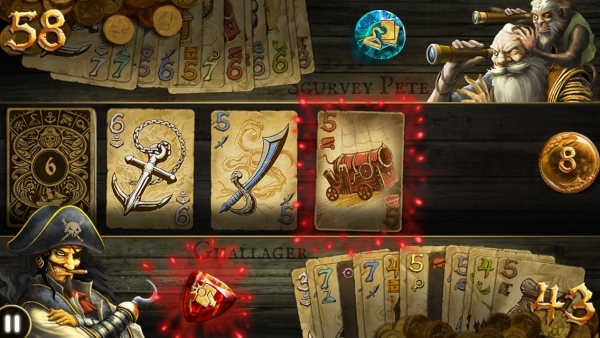 Dead Man’s Draw is, at first glance, a relatively simple card game. The concept is straightforward. There are 10 suits of seven cards. On your turn, you draw as many cards as you want, but each draw is a gamble. If you draw two cards from the same suit, you “bust” and your turn is over, with everything you’ve drawn going into the discard pile. At any point, you can bank the cards you’ve drawn, counting only the highest of each suit toward your score (for a maximum score of 70). The basic concept is fun enough, but Stardock weren’t satisfied to leave it at that. As you play, you earn gold and experience. 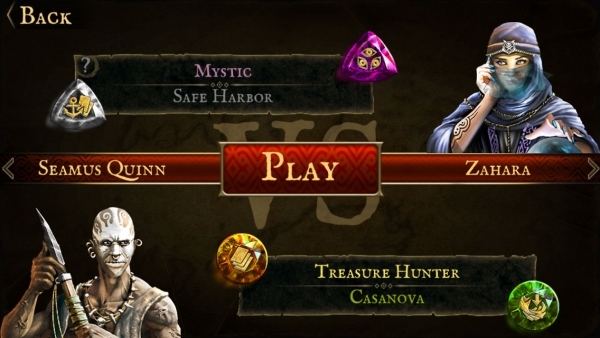 With each level gained, you’ll get access to a special ability from each suit (but beware – so will your opponents!). For example, when you draw a cannon, you can choose a card for your opponent to discard, or a sword lets you steal an opponent’s card to play. These can be combined, too, so you could draw a sword, steal a cannon, and force your opponent to discard a card. As you grow in levels and gain more of the suits’ abilities, the game takes on a completely new dynamic aspect. Every card you draw will somehow affect the outcome of the game. It blends the satisfaction and thought of a strategy game with the excitement of games of chance, brewing together an addictive experience that will keep you coming back for more. One of my primary problems with Dead Man’s Draw, as seems to be the case so often with mobile games today, is the microtransaction system. After you’ve unlocked all the suits’ abilities, you begin to unlock “traits” that will give you special allowances in a match (such as cannons destroying every card of a suit instead of the top card in a stack). These traits have limited uses, though. How can you get more trait usages? Why, pay real money for them, of course! There’s no promise this will help you in the long run, either, since the game is so heavily weighted toward chance and odds. It feels like it could have been worked around, especially since they’re already charging $1.99 for the game. The difficulty in the game is also a moot point. Every opponent you face plays virtually the same. They will all use everything at their fingertips to take you out. They are all absolutely ruthless. It doesn’t matter whether you’re playing in the first tournament or the final tournament, they will all send you straight to Davy Jones’ locker if they’re able. The visual aesthetic of the game is great. 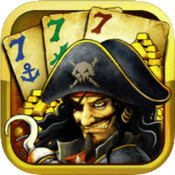 It all maintains a theme consistent with swashbuckling and maritime piracy. This game feels like it would be right at home in a scene of Pirates of the Caribbean, with Jack Sparrow busting on a hand and shooting some no-name bilge rat. Characters fit the theme beautifully and the suits of the cards could’ve have fit better in any other world. The UI design is also well done. 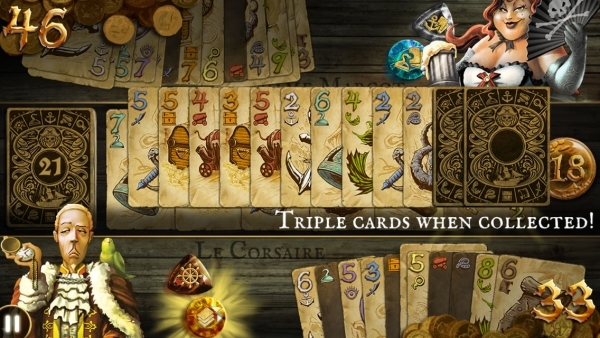 The game is easy to pick up and intuitive to play, thanks to hints given visually to the players. Everything is easy to navigate and that makes for great player experience. The audio in the game fits thematically with the visuals. Sea shanties rule the soundtrack and it works well enough, but with only two tracks that loop fairly quickly, you may grow tired of the music before long. The sound effects, like the UI, do a great job mixing entertainment with usability. 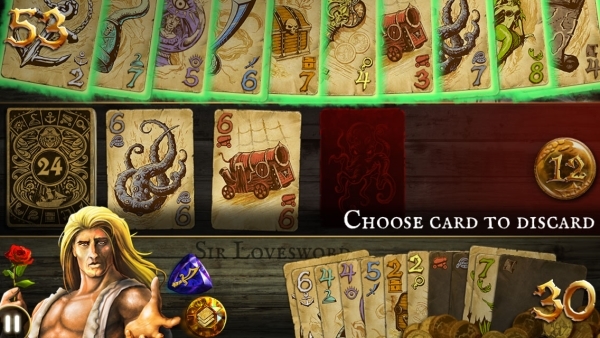 They grant cues to the player on what effects cards have and what’s going on, helping to keep everything connected and moving along. *- There is the chance that Stardock may sell printed decks in the future. You can go to their website and sign up to be notified.